Basket Full of Wishes is rated 5.0 out of 5 by 1. Rated 5 out of 5 by Greysandtorreys from Bright and cheery I got this for my folks the end of Dec. when they moved from their house to a retirement apartment. I wasn't sure what flowers could be sent that would be bright, cheery and welcoming in the middle of winter. The florist did it. The flowers were bright, fresh, and sunny yellows. My folks were delighted. This beautiful arrangement is fully stocked with sunny blossoms that will brighten anyones day. Complete with a basking butterfly in the midst of the arrangement, this will be sure to deliver some light into their life. 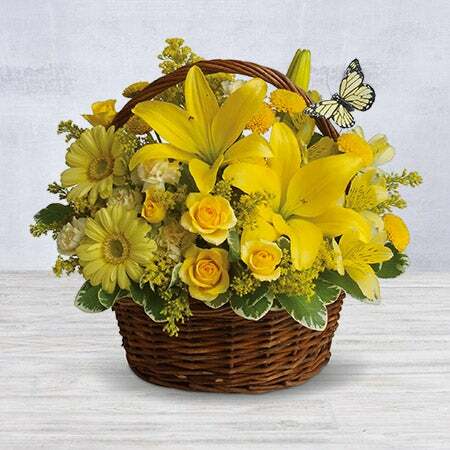 Brilliant yellow spray roses, asiatic lilies, miniature gerberas, carnations, alstroemeria, button spray chrysanthemums and delightful greenery are joined by a delicate butterfly in an oval basket.